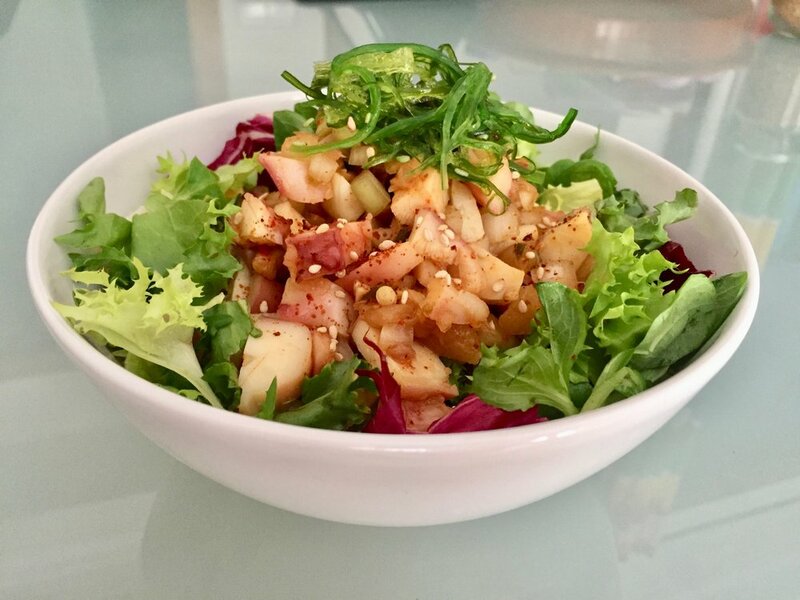 This summer, I've started making poke, the Hawaiian salad of seafood. It's just the perfect dish when it's hot outside, and you don't want to turn on the stove. You just cut up the fish, and mix it with some onion, scallions, soy sauce, sesame oil... maybe some honey and citrus too, if you like. And with just some salad, dinner is ready! (Oh, and it's paleo-friendly, grain-free, low-carb too, if you're into that sort of thing). Here's an octopus kimchi poke I made. Octopus poke is super easy to make in Spain, because they sell bags of frozen sliced, cooked octopus. So you can keep a bag in the freezer, and just defrost, mix with the ingredients, and done! But it wasn't until I came back to California this summer that I went to my. first. poke bar!! I know! I felt like such a country bumpkin when I stood in front of the menu board bewildered by the myriad of options, not knowing what to choose. Even more of a country bumpkin when I told my cousin to go in front of me to order, telling her that I was a beginner at poke, and she looked at me in shock. Haha! I think what really surprised me was just the number of options, and ways of configuring the options. As a base, do you want white rice, sushi rice, brown rice, salad, or half and half of two options? Which fish do you want? Hamachi, tuna, salmon, spicy salmon, shrimp... You can get 2, 3, or 4 scoops depending on your order size; do you want all the same, or different? Which mix-ins? Which sauce? Do you want to combine two sauces? What's in the house dressing? What's spicy house? What's the difference between ponzu and yuzu? At the end of the process, you get a pretty big plate of food! I love the different elements that you can combine, or eat separately if you'd like. This one is my poke bowl from Poke Bar in Berkeley. And this one is from Hashtag Poki. I though their "free" sides were really nice, like the squid salad, and interesting, like the macaroni salad. I guess that's Hawaiian? Healthy, customizable, and fast, there's really not much not to like. Even the prices I found quite reasonable. The small sizes I found were about $9, regular about $10.50, and large about $12, where a regular size is quite a substantial meal. 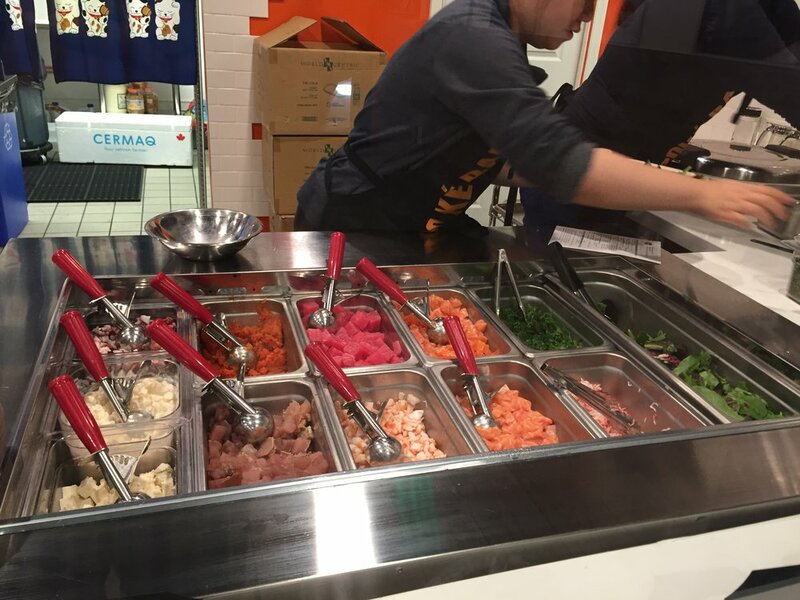 Poke bars are one trend that I would love to see spread worldwide!